Sensation prevails after a herd of wild elephants killed one person at Guwabari area along the Indo-Bhutan border in Baksa district on Tuesday under the Bodoland Territorial Area Districts (BTAD). It may be mentioned that in the last several days, wild elephants continue to create fear-psychosis among the people of Nagrijuli area along the international border in Baksa district. The deceased has been identified as 54-year-old Laksmindar Barman, a resident of Guwabari village (Barman Supa) under Nagrijuli Police Out post in Baksa district. 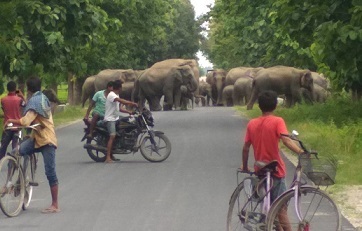 According to locals, a large herd of wild elephants entered Guwabari village in search of food and unleashed a reign of terror in the village. “The people of the village started to leave their houses and belongings and have taken shelter in secured places. On the other hand, some of the villagers tried to shoo the wild elephants by creating sounds using utensils, empty drums, etc. But a huge wild elephant attacked the group of villagers. While the other villagers managed to escape but Laksmindar Barman fell down on the ground and he was trampled to death by the wild jumbo,” said the villagers. On Wednesday morning, Nikhil Singha, the in-charge of Nagrijuli Police Outpost, reached the spot with a police team and later the body of Laksmindar was sent for post-mortem. Another herd of wild elephant entered the Arangajuli village and destroyed the houses owned by Lohit Sutradhar and Renu Sutradhar. The herd of wild elephants also ate all the paddy and rice stored inside the houses. On Wednesday also, a big herd of wild elephants was seen moving at Nagrijuli. People demand security of their lives and property as well as the the lives of wild elephants.